It's been called "a puzzle wrapped in a mystery." 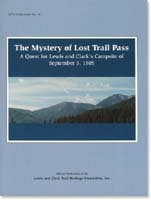 Where was the Lewis and Clark Expedition's route of Sept. 2-4, 1805, and where did they spend that cold, wet night of Sept. 3? Five authors present arguments to support their ideas, complete with maps. But you be the judge. 76 pages. REDUCED PRICE.